Heat oven to 400°F. In large bowl, mix 1 1/4 cups flour, the oats and brown sugar until blended. Cut in cold butter, using fork or pastry blender, until mixture is crumbly. (Do not overmix.) Set aside. Remove pie crusts from pouches. On lightly floured surface, unroll and stack crusts one on top of the other. Roll to 17x12-inch rectangle. Fit crust into ungreased 15x10x1-inch pan, pressing firmly into corners and sides. Fold extra crust under, even with edges of pan. Flute or crimp edges. In large bowl, stir Filling ingredients until well coated. Spread evenly in pan. 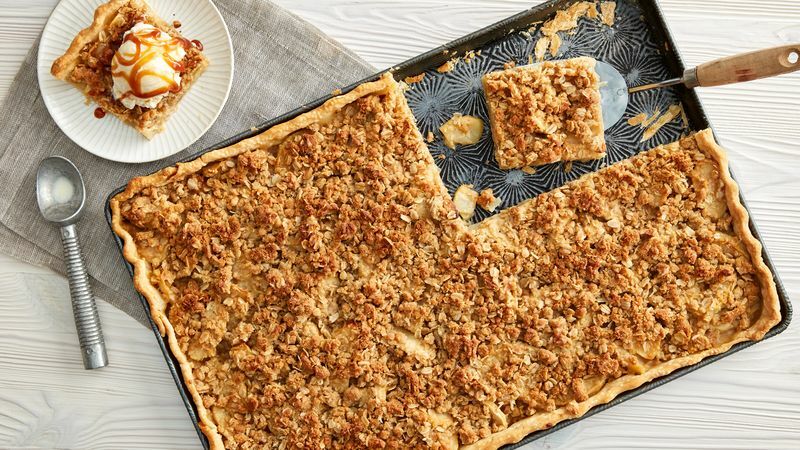 Sprinkle streusel over top of apples. Bake 38 to 43 minutes or until crust and topping are golden brown and filling is bubbly. Cool at least 20 minutes before cutting. Cut into 6 rows by 4 rows. Serve with ice cream, and drizzle with additional caramel sauce. Slab pies are the perfect pie for potlucks or large gatherings--easy to put together and serves a crowd! Granny Smith apples were used in this recipe--choose your favourite baking apple, such as McIntosh, Braeburn or Honeycrisp.